I like reading end of the year recaps. Not the smarmy Michelin star measuring contests, but the ones that capture how diners feel about their city at at a point in time. These stories can be very telling and if you read the latest crop for 2010 you get a clear sense that the natives are getting restless. In 2010 a number of food writers suddenly stopped exalting the virtues of upscale comfort food and started taking the restaurants in their cities to task for phoning it in. With notable exception of Bay Area (and maybe Chicago; I am not so sure about New York), restaurants across the US are lowering their standards and generally lacking in ambition you tend to find in truly vibrant food communities around the world. A year ago fried chicken, gourmet burgers and “bacon-as-a-major-food-group” were the prevailing trends and now the backlash is slowly building. Suddenly diners want more, even as their dining budgets get lower. John Kessler took the unusual step of expressing his frustration with the state of dining in Atlanta in the form of an open letter to the city’s chefs, but the story that captured this sentiment best came from Hanna Raskin of the Dallas Observer, who pulled no punches when she called Dallas “dining nowhereville”. Say what you will about her limited perspective and only being on the job for 5-6 months, but the story is well researched and rings true for many cities like Dallas and beyond. As tempting as it may be, it’s a mistake to treat the disappointment expressed by these writers as gratuitous whining. Critique has it’s place and can be a catalyst for change. Five years ago Daniel Patterson threw down the gauntlet in what I consider to be a seminal essay on lack of ambition in cooking (To the Moon, Alice?) and in a lot of ways the restaurants and dining public in San Francisco responded. Bay Area is now the most exciting place to eat in the country and Patterson is one of the chefs leading the way. Is Houston one of these cities hopelessly stuck in a do loop of food clichés? Yes and no. In her annual recap of best openings of 2010 Alison Cook scratched around the bottom of the barrel and couldn’t come up with 10 openings worth noting, finally capping the list to 8 entries (including a crepe stand). This is a sad state of affairs in a city of 6 million people, who are increasingly resigned to restaurants that charge premium prices for interchangeable menus of comfort food staples. Yet there is a distinction in outlook and tone held by food writers in Houston, who mostly express optimism and genuine excitement about where the city is going. The source of this optimism are not the established restaurants or named chefs who have the resources to push dining to new heights. 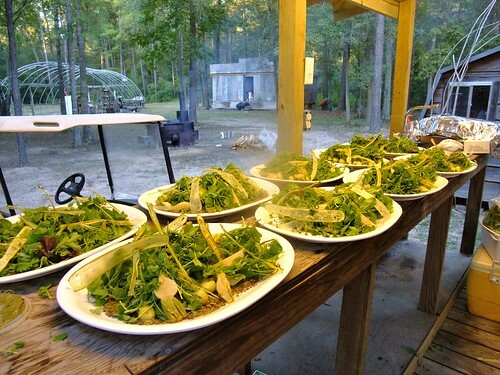 Improbably, the best cooking in Houston now comes from the gastro-underground – pop-up restaurants, supper clubs, special events thrown together in obscure locations, farm dinners co-produced by young chefs without a kitchen of their own and farmers themselves. In some cases these renegade chefs graduate to running their own underfunded, bare bones restaurants in remote suburbs (think: Roberta’s in Brooklyn), but continue to maintain a decidedly DIY bend focused on food first and commercial appeal second. This isn’t because these chefs are allergic to money and success. It’s just that restaurateurs with resources to back these chefs place their bets elsewhere. If you follow along with Alison Cook’s recap of Houston dining trends of 2010, you won’t find a word about burgers, cupcakes or the fast-casual land grab that usually dominate such lists. You do find her admiration for Houston’s vibrant food underground – progressive dessert tastings by daring pastry chefs, off the record multi-chef events at restaurants like Chez Roux (instigated by Randy Rucker) and a couple of renegade chefs who shook up the city with their Just8 concept and continue to do disruptive work in other venues, like Kata Robata (best restaurant operating within city limits today). Even the bastion of corporate steak, Vic and Anthony’s, gets a nod for their non-traditional approach to beer dinners. Other writers took notice, too. Justin Yu, who in 2010 cooked and eaten at some the best restaurants in Bay Area, New York, Belgium and Denmark, writes “In all the cities I’ve been in this year, Houston’s dining scene probably has been the most exciting and thriving”. Alan Richman of GQ Magazine pushed a dish at Bootsie’s to the top of his annual list of best dishes in the country. Underground cooking in Houston sits right besides such restaurants as Commis in Oakland on the list of best meals of the year by Ruthie Johnson Miller of CultureMap. Having eaten my share of amazing meals this year, I have to agree. Some of the most exciting food I came across was right here in Houston. Just not in venues where you’d expect to see it. If you buy what I am selling and believe that something is really happening in Houston’s food underground, the question becomes this – how is it possible that in a city distinguished by it’s rich multi-ethnic cooking traditions much more so than restaurants that push the boundaries of food, a crop of young chefs emerge out of nowhere and manage to ignite such excitement? Where do they get their inspiration, their drive, their training? Bigger question is, how do we support their efforts and make sure this movement continues to grow? What’s the missing ingredient? I’ll follow up with my thoughts in my next post. For now, leave a comment and give me your take. 2011 is one hour away and everyone is finished with their illustrious 2010 retrospectives at this point. Me? I march to the beat of a different drummer. He’s the second part of my unfinished ‘2009 in photos’ post (a promise is a promise). I found this scared crawdad on a floor of a grocery store in Houston, where more crawfish is consumed than in any city in US (according to Jim Gossen). It’s odd how protective you can feel about a creature that you’re consume without giving it much thought under different circumstances. That didn’t prevent me from demolishing at least 60 pounds of crawfish that year. This shot is from the uni dinner Randy Rucker hosted while he was still at Rainbow Lodge. 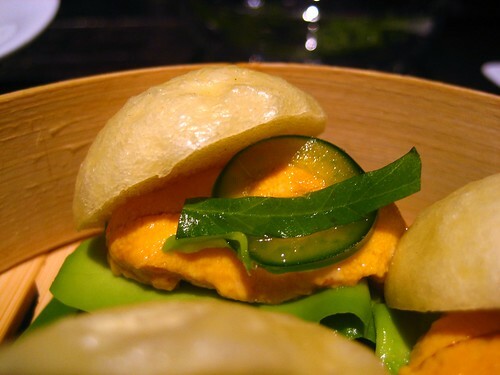 Big lesson – sea urchin is amazingly briny and bright directly out of the shell. 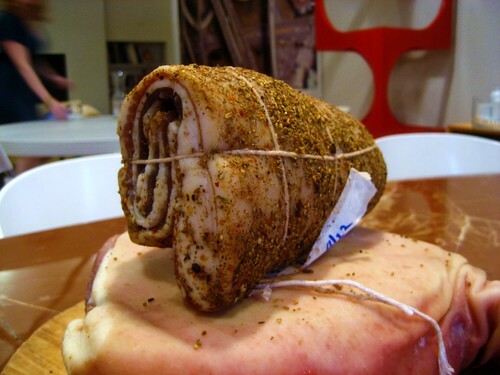 Give it a few hours and the flavor becomes muted. This is why sushi in US will always have a tough time coming even remotely close to what you find in Japan. The pork belly at Feast in Houston is one of the best preparations of this cut I’ve ever encountered, owing to skin that’s crisp enough to shatter on impact. Proof? 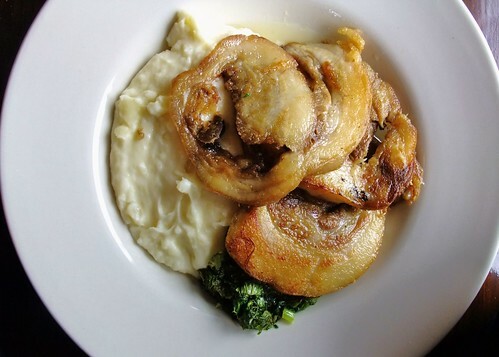 My most recent meal at The Sportsman included a similar pork belly dish prepared by a chef I consider one of the best in the world (Stephen Harris), but not one as good as what you find at Feast. In summer of 2009 I made the first of many visits to Pho Binh Trailer, which became an instant Houston classic for me. This is one of the top 3 dishes I recommend to food obsessed visitors to the city. It never fails to make a huge impression and continues to be on my “must have” list for Houston. In August I had the honor of judging the Pork Belly Throwdown at Catalan. It was a total blur and the first time I really understood just how big the Houston grassroots food community has become. Also in August, first edition of the Chicken Fried NY Strip at Beaver’s (now considered a classic), which is perfect example of flavors that define Houston cooking – big, bold flavors channeling the South and Gulf Coast. Of all the meals I had at Catalan in 2009, this slightly chewy, intensely flavored grilled pork on the meze plate inspired by Chris Shepherd’s trip to Turkey stood out the most. Catalan remains one of my favorite restaurants in the city, because nearly every dish is a testament to just how much Chris loves eating Houston. If you love food, you can’t help but find his enthusiasm infectious. 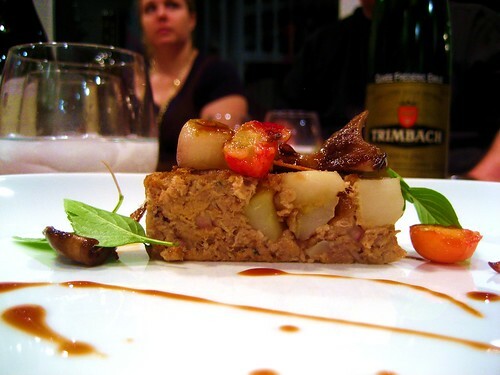 Late summer 2009 – one of the most surreal meals of my life. There was a lot of tension at Rainbow Lodge that night, Randy was obviously going through a rough time and yet the kitchen crew cooked one of the best meals I had at Rainbow Lodge. I could tell that the entire kitchen crew was on edge, but this dish built around duck breast, buckwheat pasta, mushrooms and dashi was as good as anything you find in some of the most progressive kitchens in the world. In 2010, the same crew re-united at Bootsie’s and is already turning heads on the national stage. 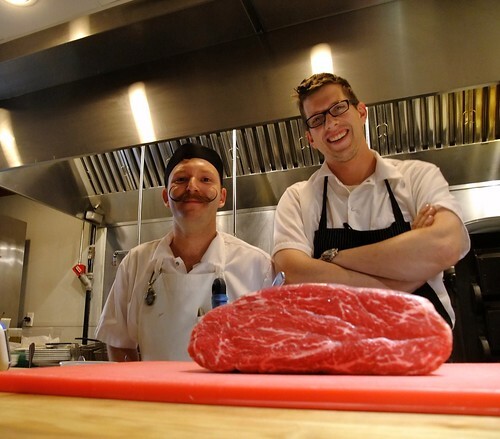 Expect big things coming from Tomball as Restaurant Connate launches in Spring of 2011. In September I finally figured out how to eat in Las Vegas without disappointment. Aburiya Raku (off the strip and infinitely affordable) is the best izakaya I’ve found, including in Japan. Best item on the menu is what I consider a reference version of agedashi tofu, made in house and stunning in every way. By the end of September I was in Paris, where I finally got to try Pierre Herme, which was closed on my first trip. Highlight of this trip was a visit to Le Chateaubriand, where Inaki Aizpitarte is creating a brand of cooking entirely different than what you typically find in France. In 2010 I revisited Le Chateaubriand and had an even stronger meal than in 2009. This is one of the worst dishes I had in 2009. The meal at Pierre Gagnaire was as stunningly disappointing as it was expensive. Gagnaire was in the kitchen that night, but much of the food was erratic, pointless and over-manipulated. Desserts were stunning, however. This is one of the best dishes I had in 2009. Noma was more than worth a trip to Copenhagen and proof that Scandinavia is at the forefront of where food is today. By 2010 it was named the best restaurant in the world. When I arrived in Copenhagen, I had no idea it was the Olympic city decision weekend, which meant that Michelle Obama and Oprah were causing massive traffic delays. Tokyo was eliminated first, rendering their fans only slightly subdued. They were dressed like Picachus. The best thing about London may be it’s relative proximity to Seasalter, the most beautiful setting for a restaurant I have ever seen. The c0-owner of The Sportsman (chef’s brother) spent many years in Texas and believes Houstonians are some of the nicest people in the world. In kind, I think this is one of the most essential food experiences in the world, so the admiration is mutual. Somehow between Europe and Japan I found myself in San Francisco… home of surprisingly good Cajun food (?!). These savory beignets at Brenda’s French Soul Food are filled with crawfish and dusted with cayenne. My trip to Japan in November has redefined the way I view food and purity of ingredients. These intensely flavored micr0-tomatoes at Sawada are of many reasons why. The visit to the Tsukiji market in Tokyo was one of highlights of my trip to Japan. I was only beginning to grasp the special relationship the Japanese have with food. Being able to shadow Masahiko Kobe (original Iron Chef Italian and an incredible cook) as he shopped for his dinner service and allowed the market to shape his menu really brought it home. A week later I was in New Orleans, consuming obscene amounts of while Alba truffles at Scott Boswell’s Stella!. Truffles were everywhere that night, including in this dessert course of deep fried truffles perched on top of truffle ice cream. It’s was as good as it sounds. It snowed in Houston right before Christmas. I headed straight for Feast. 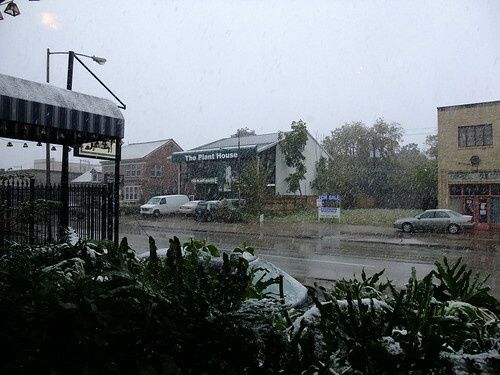 No better place to spend a snowy day than Feast. No better dish than Bath Chaps. And that’s how 2009 ended. I still plan to finish my 2009 wrap up in photos, but first a few words on my new favorite way to eat steak in Houston. Only days after I noted that Justin Basye coming to Stella Sola improves our chances of seeing him in the kitchen of his own, an unfortunate chef shakeup did that just that. Now that the restaurant has been on solid footing for a few months the Stella Sola team is already making things in Houston more interesting. Exhibit I: a re-imagined rib eye that instantly became my favorite way to eat red meat. I am not a huge fan of steak houses, mostly because I see no reason to gorge yourself on a massive slabs of meat served at these places. The 20th bite tastes almost exactly the same as the 1st. There is just no point. But the Truck Stop Ribeye at Stella Sola makes things interesting. It’s not a huge cut of meat, but a much more manageable portion which should keep your attention. Arugula, onions and marinated tomatoes ensure surprisingly acidic and bright flavors for a meat dish. The best part is that there are no boring parts of the steak, which is where a little bit of food science comes in. The reason the truck stop rib eye at Stella Sola tastes so good is because it’s an engineered steak, which is not to say it’s not a natural product. The cut used in this dish is the rib eye cap, also known as spinalis dorsi, revered for its big beef flavor and tenderness. 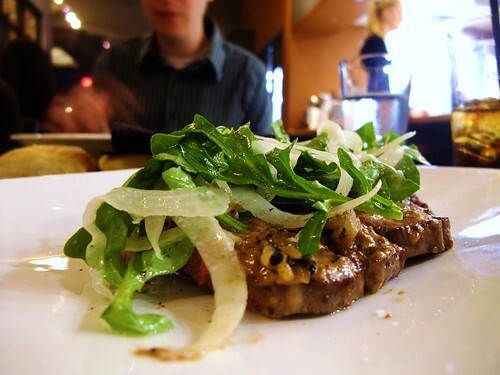 The rib eye cap is matched only by the tenderloin (which is as tender as it is boring) and the flat iron steak. 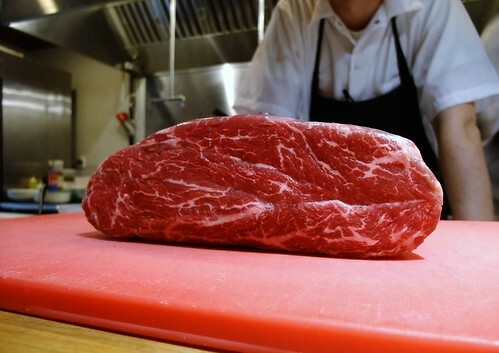 It’s possible that the reason you don’t see the rib eye cap on restaurant menus is because it gets picked by butchers and cooks long before you can get your hands on it. A more probable reason is that the spinalis dorsi just isn’t big enough to be a serving on it’s own. At Stella Sola the truck stop rib eye is constructed several spinalis dorsi muscles fused together with transglutaminase, also known as meat glue. The result is something that handles like a regular steak and tastes terrific. The Truck Stop Ribeye isn’t the only reason to go to Stella Sola. Since its opening late in 2009, it has become one of my favorite new restaurants in town and the kitchen is staffed by some of the best young chefs in the city. The crudo, the house cured meats, the fantastic lardo, the bone marrow and the pastas are all excellent. As it sheds some of the Reef redundancies (which can be too apparent) from the menu and establishes its own identity, I expect Stella Sola to only get better in 2010. Plus, you have to love any place where the cooks are ready to whip out their meat and pose for photos at any moment. It’s unlikely I’ll ever have a year quite like 2009. 11 cities across 9 countries, countless amazing meals in some of the worlds best restaurants and grungiest of dives, none of it properly documented in this blog. The year began with my personal rendition of a cajun cassoulet, built around smoked ham hocks, ox tails and duck confit. Yes, I cook. This photo of a nettle sformatto from Quince in San Francisco taken in early January is only notable because it came with a stern warning from the manager that “the chef would prefer you did not photograph his cuisine”. This would be my second and final trip to Quince. The food in Sydney is almost universally bland, but the hottest sauce at this stand still made my entire face hurt. I suppose I deserved that. The liquid nitrogen treated Hemingway cocktail at the Bentley restaurant is one of many highlights in Sydney. In-n-Out makes a great burger and it somehow tastes even better after a long night at Manresa. After much experimentation, I have decided that my perfect burger is a 3×3, hold the animal style. Only 12 hours after we came back from Sydney, Isabell passed away after a long bout with cancer. She was my best friend. This onion tart, as simple as it is incredibly complex, turned out to be the last time I’d have the opportunity to eat at Le Reve. The best restaurant in Texas served it’s last meal in 2009. 20 years after leaving the city where I grew up, I returned to Moscow. The bread tastes exactly the same, but there is now a huge number of street food stands dotting the city. Rotisserie chicken, doner kebabs, and shawarma seem to be popular. By the end of our trip to St Petersburg my friend commented that he ate more sour cream than he ever had in his life. I told him he was exaggerating, just as a sour cream honey cake was delivered to our table. It was one of the best desserts I had in 2009, but I really really like sour cream. I waited a long time to try Jose Andres’ food and it was worth the wait. One of my best meals in 2009 was at Bazaar. The fist of my two trips to Louisiana yielded a visit to Al-T’s, a rather unremarkable place that has a stellar boudin ball. It’s hard to explain to non-Texans how great it is to live in Houston and be in close proximity to the full bounty of Gulf Coast cuisine. This photo certainly gives you a clue. Cajun Charlie’s in Sulpur is conveniently located next to a cemetery. There were zombies in the parking lot. In March I had my first tasting at Rainbow Lodge, where Randy Rucker did some of his best work this year. These octopus suction cups with fennel flowers was one of my favorites. Zoe arrived in March. She’s really great. The beet salad remained a staple on the menu at Voice, this time in a form of a homage to Michel Bras. In April I finally had a chance to try the iconic Ben’s Chili Bowl in DC, a few months before Ben passed away. My best meal on that trip was at Komi, but they were too full of themselves to allow photographs of food. Those people can bite me, but I’ll certainly be back. I came back to Houston and found out that the best pupusas in the city are made exactly 1.4 miles away from my house. This is why I love living in Houston. The canapé and cheese service were the best parts of my dinner at Cyrus in Healdsburg. You expect more from a ** restaurant. One last meal at A16 before Nate Appleman left for New York and became a rather irritating TV chef. I sincirely hope A16 is as good without Appleman as it was with him in the kitchen. My dinner at Coi turned out to be one of the best meals of the year and this dish may have been one of the best. Carrots, sorrel and burnt breadcrumbs was the most striking dish of the night. Dessert tastings with Plinio Sandalio became one of the highlights of the year and an attraction for the few gastro-tourists Houston gets. Even something as terminally boring as cupcakes are special. I’m not sure why it took me so long to get to Burns BBQ, the closest you can get to the level of cooking you find in Luling and Lockhart. I am glad I did before Roy Burns Sr. passed away in December. View from the plane on the way to Denver, where sushi is (most improbably) some of the best in the country. Biggest surprise of the year turned out to be Aburiya Raku in Las Vegas. Even after my trip to Japan, still some of the most stunning Japanese food I’ve ever had. In May I finally had a chance to eat at Uchi in Austin, one of the best Japanese restaurants in the US. This simple house salad with hydroponic baby greens and Texas inflected edamame-jalapeno vinaigrette was one of my favorite items on the menu. A day later driving through Lockhart I found some of the best BBQ in Texas (and therefore the universe) at Smitty’s Market. The kitchen crew at Rainbow Lodge really hit it’s stride in June, turning out the most inspired and consistent food in Houston. Manabu Horiuchi landed at Kata Robata and made it possible to eat sushi without disappointment in Houston. Next post – “2009 – a year in photos (July-December). 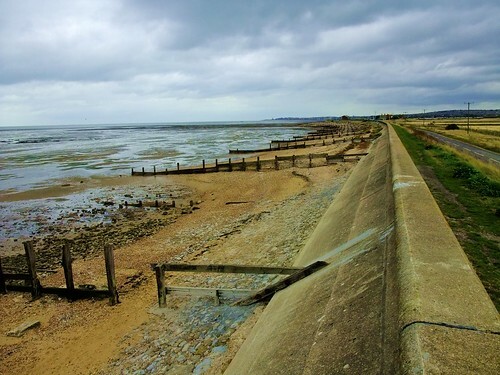 I wrote this on my way to Seasalter several weeks ago and finally had a chance to finish the post. More on the Sportsman later. As much as I enjoy traveling, I always look forward to coming back home and not only because I am hopelessly addicted to Tex-Mex and the incredible range of food found in Houston. What I’ve found lately is that there is also a young crop of chefs who show enormous promise and may shape what we eat in Houston for years to come. I’ve written about a few in the past, but failed to note Justin Basye, lately of Voice and now of Stella Sola, a new Texan/Tuscan (?!) restaurant yet to be opened by Bryan Caswell and Jason Gould. If there is one thing that the Tenacity dinners have taught me is that the executive chef isn’t always the only (or even most) talented guy in the kitchen. The supporting cast are incredibly passionate about food and have a voice of their own, which always takes a back seat to almost everything else – restaurant concept, cost constraints, access to tools and the need to execute someone else’s food, rather than create your own. I’ve only had Justin’s food once, but he seems like one of these guys. Justin’s pig centric Tenacity dinner last year was one of my favorite meals of the year. The food was clearly influenced by the kitchens he has passed through. There are the bold Louisiana flavors of Restaurant August, clean precision of Voice and modern technique of Laidback Manor, but the dishes he presented that night were unique in being able to isolate a single flavor and pull it into the foreground. Most tellingly, the dinner had a well defined arc, something rarely found in even established restaurants with very experienced chefs. Justin and his stellar cured meats are a great fit for Stella Sola. Most important, our chances of one day seeing him in a kitchen of his own have just improved. Speaking of Voice, my tasting from the spring menu was outstanding. Even though Justin is leaving the kitchen, Michael Kramer remains one of the best chefs in Houston and delivers great food on the nightly basis. Other than the Mad Hatter chairs that feel like torture devices, it’s a great experience.